Indian Aviation is unique but when this argument goes global, the aviation scene is compared with markets similar to India. More often than not, all fast growing markets get classified together – Indonesia, India, Kazakhstan and so on. Cheap Fares, Congested Airports, booming passenger Numbers – the markets show similar trends. 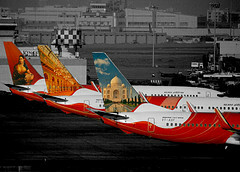 One of the reasons of uniqueness in India is the different types of airports in the country.From the greenfield ones like Bengaluru & Hyderabad, Kochi – where landholding was converted to shareholding to construct the first private airport in the country, Delhi & Mumbai which saw private players form Joint Venture to redevelop and expand, Kolkata & Chennai – where state owned Airports Authority of India redeveloped the projects. All combinations of airport construction projects seem to have been covered. There is another type – those operated by the armed forces – Indian Air Force and Indian Navy. These are airports which are owned by the armed forces sees the Airports Authority of India maintain terminal, apron space and provide city side services. The runway, Route Navigation, Air Traffic Services are all under the control of Armed Forces. Of the approximately 80 airports that are operational in the country, staggering 22 are civil enclaves. This includes larger cities like Pune, Chandigarh and Goa. Most of these airports have limited operating window. For example – Pune does not have any movement from 0800 – 1030 hours six days a week and is closed for routine maintenance from 1100 – 1700 every Saturday. Goa sees halt of civil operations from 0830 to 1300 and 1530 to 1630 hours each day. Chandigarh is closed at night. All three are in top 20 by domestic passenger traffic in India. Sir, this is clearly one of the best self-contained analyses on aviation that I have read of late. A complete analysis of types of airports, and restrictions, followed by the civil conclave concept, and an excellent set of suggestions to be fair to civil aviation players, improve utilisation, and at the same time, not compromise with the requirements of the armed forces. Welcome as always for your never ending kind words !